Chimpanzees have some similarities to people in their appearance and behaviour—which really excites evolutionists desperate to show that any differences are really trivial, especially in those areas which seem to make people uniquely created in the image of God. Not surprisingly, a popular research interest has been in comparing the language and reasoning abilities of chimps with ours. Pointing to our alleged ‘genetic closeness’ (see Human/chimp DNA similarity), some have said that we are just a third species of chimpanzee, while others have recently called for chimps (and gorillas) to be reclassified as Homo. However, just when evolutionists were riding high about their success in getting some chimps to use a very basic but definite (sign) language, some notable dampeners to their enthusiasm have appeared. First, it turns out that there is at least one parrot that can rival chimps (and dolphins) in creative language use and complexity of reasoning. Birds aren’t supposed to be our close evolutionary cousins, and they have much smaller brains. Furthermore, increasingly sophisticated tests have been carried out to discern whether chimps can ‘discern motives, plans and strategies behind observed behaviours’. That is, can they form a concept of their own and others’ mental states, as even young children do? Some had said that this was obviously the case if they were able to use language. However, there is now a growing tide of skepticism based on these latest tests. It has long been believed that both chimps and orangs are self-aware, because when they see themselves in front of a mirror with unexpected markings on their bodies, they clearly show that they can recognise themselves by inspecting the marked areas on their own bodies, for instance. However, more than one experimenter is coming to the conclusion that self-recognition may not be the same as true self-awareness, after all. Povinelli remains a committed evolutionist, and his negative results on chimps are reported with cautious, almost grudging wording at times. Nevertheless, the results of his studies indicate that ‘humans operate in a mental realm that may stay off-limits to apes and other animals ... By 3 to 5 years of age, children conclude that their peers behave according to unseen beliefs, intentions, and other mental states’—while ‘chimps may not try to decipher others’ minds in this way’. Next time you delight in the antics of chimps at a zoo, why not reflect with joy on the way they have been made? Their similarities to us, and to other apes and monkeys, confirm that we are all the product of the one Designer. The profound differences in their mental abilities reinforce the biblical reality that only people were created to commune with their Maker, who communicated His love to us in that ‘while we were yet sinners, Christ died for us’. Scientific American, April 1996, p. 23. 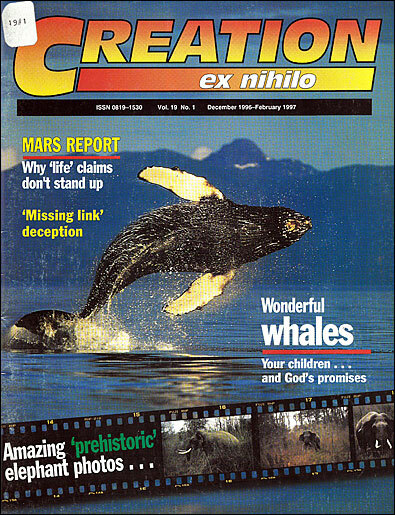 Science News, Vol.149 No.3, January 20, 1996, pp. 42-43.